Want to spread your wings and leave Orford? Well there are many lovely places to visit nearby that you can just follow your nose and see where you end up. But for those of you who want some guidance, here are a few places we’ve visited nearby, as obviously you don’t want to go too far afield! Most people are familiar with Aldeburgh for its long beaches but it really is a lovely town by the sea. Theres something for everyone here, a great place for families, foodies, music lovers, artists, walkers and cyclists. if you walk along the beach you will find Maggi Hambling’s evocative beach sculpture, The Scallop. You can also buy fresh fish and lobsters, visit the RNLI Aldeburgh lifeboat or take in events at the boating lake. There’s also Moot Hall which houses the Aldeburgh museum. Close by to Orford is Woodbridge, and often overlooked gem of a town as it is not quite on the coast but definitely worth a visit. Woodbridge is an historic riverside market town with many fine restaurants, pubs and some of the best shopping in the coastal area. The working tide mill is a major attraction. The River Deben at Woodbridge is a mecca for boating of all kinds and the fabulous riverside walk gives you every chance to feed the ducks. Woodbridge offers some wonderful views from across the river to Sutton Hoo, up river to the working Tide Mill and down to Kyson point at Martlesham Creek. 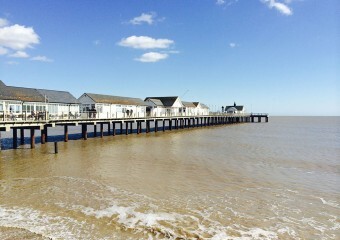 Famously the home Adnams brewery, Southwold also has a famous lighthouse and the most splendid row of brightly coloured beach huts, which you view close up or from afar from the end of Southwold pier. Southwold is host to some lovely art galleries, a fine collection of shops and of course many pubs selling the local beers from Adnams. 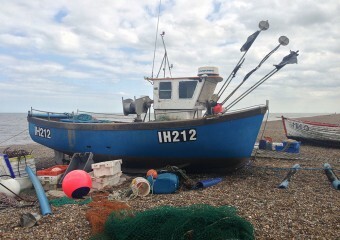 On the Blackshore harbour side you will find extremely fresh fish and also you will find the ferry which takes you across the River Blyth to Walberswick. There is something special about Southwold, you won;t find any modern amusements or fairground rides, but instead you will find a quirky cinema, an iconic lighthouse, a splendid pier, lovely sandy beaches and the delightful scent of malt escaping from the brewery. Suffolk is a county that unless you travel slowly through it, you may miss many of its charming and redeeming features. Whislt the North Sea constantly erodes the coastline of Suffolk, there are still many picturesque seaside resorts to explore, where there are sandy heaths and mud flats, flora and fauna and beautiful views to soothe even the weariest of travellers.